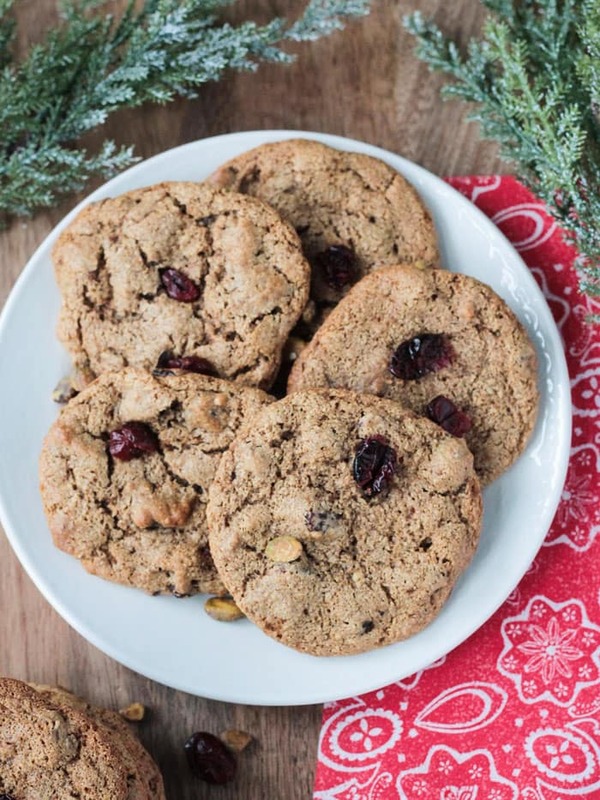 Cranberry Pistachio Cookies – perfectly festive cookies for your holidays! Gluten free, Oil free, and Vegan. Cookie exchange anyone? They are reminiscent in texture to my Cinnamon Sugar Cookies and Chocolate Gingerbread Cookies. All of these cookies are made with almond flour, making them naturally gluten free. They are also oil free and, obviously, egg free. Crispy on the outside and chewy on the inside – it’s definitely the way we prefer our cookies in this house. Holiday cookie swaps are popular this time of year. With so many people these days developing allergies to traditional ingredients like gluten, eggs and dairy, it can be a big bummer if you can’t actually eat the cookies you bring home. Do everyone a favor and make your cookies allergy friendly this year. But you don’t have to sacrifice flavor to enjoy a gluten free vegan cookie! 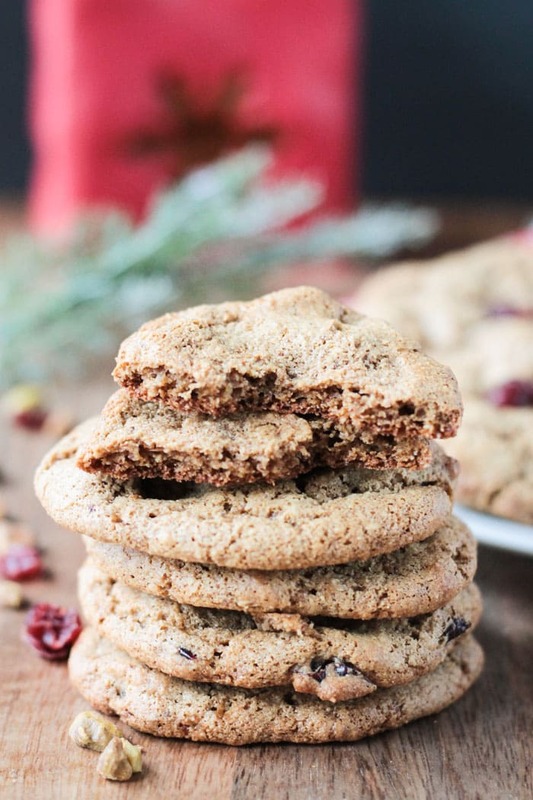 Everyone will like these Cranberry Pistachio Cookies regardless of allergies or not! 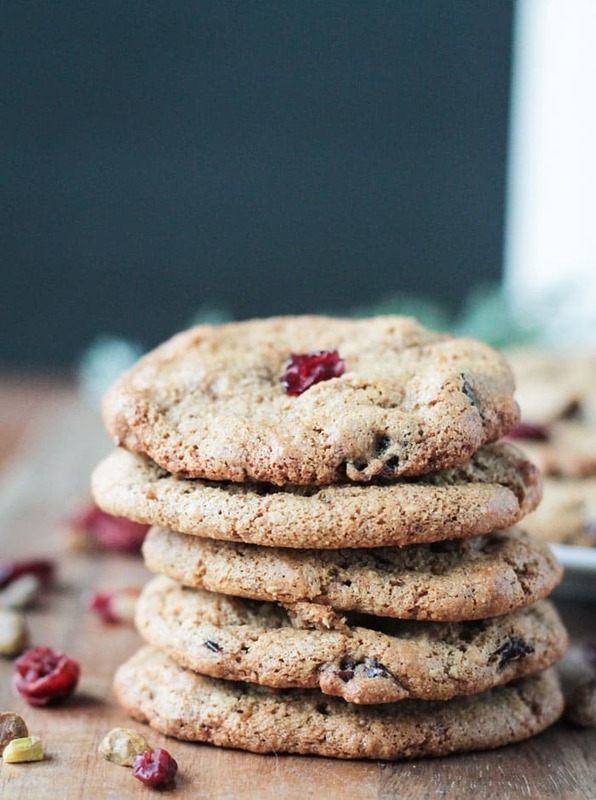 I hope you love these Cranberry Pistachio Cookies as much as we do. If you try them, please leave me a comment below with your feedback and star rating. Snap a quick pic and find me on social media too. Be sure to tag @veggie_inspired and #veggieinspired so I’m sure to see it. Enjoy! Cranberry Pistachio Cookies - perfectly festive cookies for your holidays! Cookie exchange anyone? These cookies are crispy on the outside, chewy on the inside and are gluten free, oil free and vegan! In a medium mixing bowl, whisk together the almond flour, coconut sugar, baking soda, and salt. In a large mixing bowl, whisk together the almond butter, maple syrup, almond milk, and vanilla. Stir the dry ingredients into the wet ingredients, making sure to scrape the bottom of the bowl to fully combine all the ingredients. Stir in the cranberries and pistachios and mix well. Scoop out 1-2 tbsp of dough and place onto the parchment lined cookie sheet. Leave at least a couple inches in between each scoop of dough because these cookies will spread. Bake for 9-11 minutes until golden brown and starting to firm up. Transfer to a cooling rack to continue to cool completely. Cookies will continue to firm up as they cool. The dough will be sticky and wetter than traditional cookie dough. These look perfectly chewy! And what a great combo – pistachios and cranberries go great together! They really do! Thanks, Whitney! These cookies look delicious! My husband would really love them 🙂 So good! Thanks, Christine! I hope you both enjoy them! These sound fabulous! Love that cranberry pistachio combo! Thanks, Jessica! They’re so good together! I love cookie swaps! How fun! 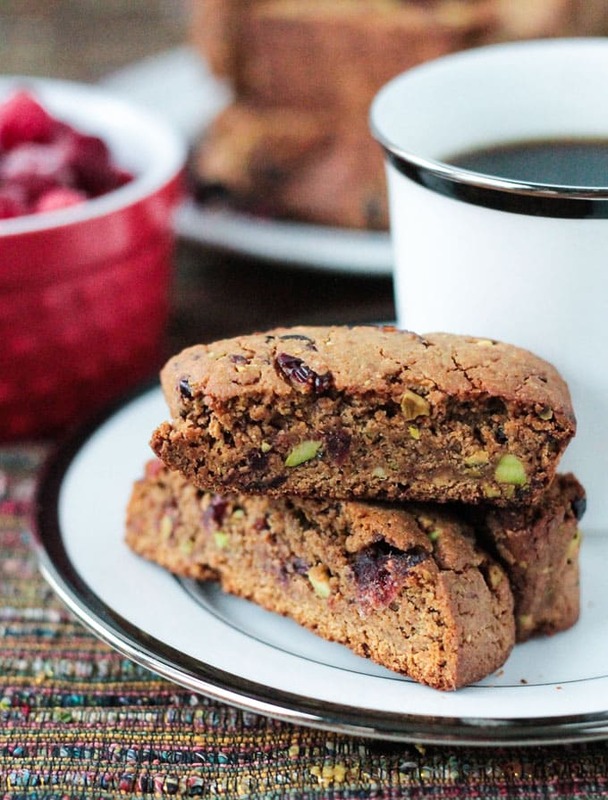 Cranberries and pistachios are perfect together! Hi, Karen. I honestly don’t know. Cookies don’t last that long in our house. 🙂 If you try it, let me know how it goes. Pistachios are my FAVORITE!!! Your cookies look so festive with the red and green flecks! 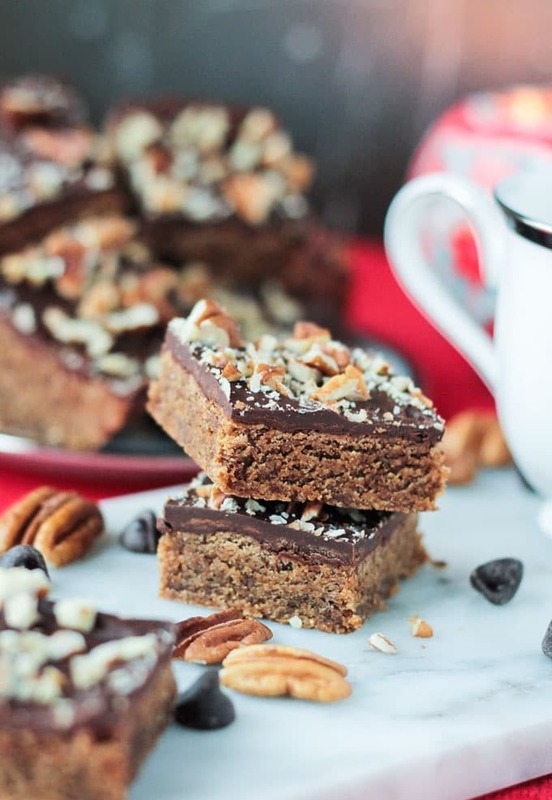 I love that these are made with almond flour! I have a bag sitting in my cupboard, and I wasn’t sure what I was going to do with it. Plus, pistachios are one of my all-time favorite nuts. It’s a win/win! Thanks, Cadry! Almond flour is my go-to for cookies these days. So good! I love these seasonal cookies! Almond flour has such a lovely flavour and it’s great that they are oil-free! I agree – love almond flour. It’s basically my go-to for cookies now. Thanks, Mel! I would love to get these in a cookie exchange. YUM! These look so delicious! I’m obsessed with pistachios so these will be perfect for me! Oh, me too. I could eat a whole bagful! I have to portion them out so I don’t overdo it. LOL! Thanks, Mary Ellen! Ohhh they look delicious! I love cookies with pistachio, and I love that you made them vegan too. Thanks, Vivian! Pistachios are addictive, aren’t they? So good!